The Golden Griffin Battalion Reserve Officers Training Corps (ROTC) develops leadership skills that last a lifetime. Whether your goal is to serve as a commissioned officer in the United States Army, or simply gain valuable, hands-on leadership training that will set you apart from the rest in the civilian job market. You don’t have to join the Army to take ROTC courses. Because the program is an elective, you can major in any program and take basic courses at the same time without making a military commitment. Many of our students make the military commitment and find rewarding careers serving their country in various capacities all around the world. Why Study ROTC in College? Upon graduation of the full program, you are commissioned as a 2nd Lieutenant and make more than $30,000 the first year. You can also serve in the Army, Army Reserves, and the National Guard. The Golden Griffin Battalion is one of the top-ranked ROTC programs in the country. Additionally, the program was ranked as one of the top performers in Army Cadet Command’s 273 national units. The U.S. Army Cadet Command and the General McArthur Foundation unit ranked the unit 1st in the eastern United States for medium-sized detachments. ROTC graduates are stationed all over the world and work in areas such as military intelligence, signal corps, infantry branches, field artillery, and many others. Our students are scholars who keep their grades up, athletes who are physically strong and leaders who have a great desire to learn. The Military Science Program is designed to augment the college learning experience; identifying and developing future leaders is the cornerstone of our program, regardless of future military service. Reserve Officer Training Corps (ROTC) classes are college electives you can take for up to two years without incurring a military obligation. Our program of instruction includes leadership development, basic military skills, and adventure training. The program is open to all students regardless of major. Students at Buffalo State who are interested should arrange to meet with the campus ROTC liaison to learn more and complete the necessary cross-registration process. Want more information about ROTC opportunities at Buffalo State? Registration for fall 2018 is now underway if you are interested in registering for MLS 101 or MLS 201, the introductory courses for freshmen and sophomores, please see us ASAP. All other levels of students may be accepted on a case by case basis. 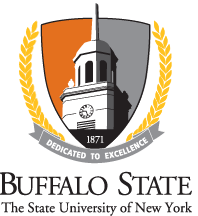 MLS courses are cross-registered through Canisius College; Buffalo State students must be, and remain, enrolled full-time at Buffalo State in order to participate. For more information, please stop by Cleveland Hall 210. Academically strong – the average cadet will have a 3.0/3.5 GPA and SAT scores >1200. Physically fit – the average cadet will be involved in sports or fitness activities. Leaders – the average cadet will have proven leadership experience in school or in the community. ROTC courses can be taken as electives with no commitment for up to two years. Time management and leadership skills gained from ROTC coursework benefit all students. Students meeting academic and physical requirements are eligible to apply for full scholarships. Contracted student/cadets receive a monthly Cadet Stipend. May request the option to be housed together. Provided with military honors cords at graduation. Classroom and lounge space with refrigerator, television, computer/printer. Dedicated staff person to assist with advisement, registration, and other academic needs. ROTC requires a commitment of time and energy. Cadets are expected to make participation in ROTC activities a first priority (especially at the MS3/4 levels), which may preclude involvement in other extracurricular activities. ROTC activities require participation during the evening and weekends. Scholarship/contracted cadets leaving the program may be required to repay funds. Cadets may be terminated from the program for physical inability, criminal/drug related convictions, and/or other infractions. You will need to provide proof of U.S. citizenship, birth certificate, social security card, driver’s license, high school transcript, SAT/ACT scores, transcripts from other colleges attended, and immunization records; other items may also be requested. The Army ROTC Basic Course generally takes place during a student’s freshman and sophomore year in college. The first year focuses on development of individual leadership skills and introduces techniques that encourage students to become effective members of a team. Additional emphasis is placed on value and organizational ethics. The second year focuses on motivational techniques, organizational ethics, values, and counseling as part of team dynamics within military organizations. In addition, while enrolled in the Basic course, students can gain “hands on” training in land navigation, military tactics (paintball), rappelling, and physical training! Students who enter the ROTC Advanced Course incur a military obligation. All students entering the Advance Course must meet contracting criteria. While this usually occurs at the beginning of the students’ junior year or first year of graduate school, some students will contract during the ROTC Basic Course years or prior to CIET. The Military Science (MS) III year focuses on evaluating and executing adaptive, dynamic team leadership skills in preparation for attendance at the US Army Cadet Summer Training (CST). Cadets learn basic small unit tactics and Soldiering skills to include the military planning and decision-making processes, Operations Orders (OPORD), map reading and land navigation skills. Students are expected to fully participate in physical readiness training (PRT); classroom instruction, leadership labs and Leadership Training Exercises (LTX). Cadets will comply with Army Regulations (AR) 670-1 and AR 600-9 at all times. Cadets are expected to conduct themselves in a responsible and professional manner during classroom and field training, as well as during their personal time. Cadets will receive timely and specific feedback on their leadership abilities and potential for service as an Army Officer. As you can see the MS III year is an important year for leadership development. The MS IV year focuses on staff organization and function, the Army’s training management system, counseling methods and leadership. Leadership development continues in this year and Cadets apply the leadership training they have received to date as members of the Cadet Battalion Staff. The MS IV year is the final preparation of the ROTC curriculum. Students who successfully complete the ROTC curriculum and have their degree conferred are sworn in as Second Lieutenants. Cadet Summer Training is a 30-day event held at Fort Knox, Kentucky. This training will focus on developing additional critical thinking skills that are required of Second Lieutenants. It is designed to increase the skills learned on the college campus and instill the importance of the “job” a Second Lieutenant holds in the Army organization.